Tomorrow morning, my husband and I will board the ferry to leave the island with 14 kids and 2 faculty members from our local high school. By boat and bus and train we will make our way to Manhattan to participate in a Model UN conference. Several thousand high school kids from various points on the planet will gather to learn in a simulated UN experience - participating on committees, hearing position papers, drafting resolutions, making judicial decisions - - working together across language and cultural barriers to create solutions to real world problems. Immigration issues will be among the topics they will work on. Meanwhile, this morning's paper editorializes on the effort to “devise new forms of bureaucratic cruelty for immigrants. 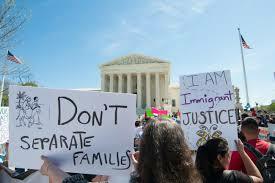 The latest policy proposal from the Department of Homeland Security would separate children from their parents at the Mexico-US border if they’re caught trying to enter the country illegally.” (Boston Globe “Border policy on kids harsh and ineffective” Tuesday March 14, 2017 p. A8). There is a scenario in the Christian texts where some of Jesus’ own disciples try to keep children away from Jesus. His stern rebuke rings in their ears: “Let the little children come to me, and do not stop them; for it is to such as these that the kingdom of heaven belongs.” Even more pointed, Jesus teaches “whoever welcomes one such child in my name welcomes me. If any of you put a stumbling block before one of these little ones......it would be better for you if a great millstone were fastened around your neck and you were drowned in the sea.” The “little ones” - - young children - - perhaps just “innocent ones” - - perhaps any child or youth or adult who is defenseless against the power wielded against them. Even as this country continues to wrestle with what “family” means there are still some norms that remain in our collective consciousness. One of them is the notion of the value of the family as a social construct that promotes the safety and well being of children. Stable families tend to give children a stronger start in life. And yet, there are policies in the making that would destabilize and destroy immigrant families. Currently, mothers with children who are caught at the southern border trying to enter this country, seeking asylum, are processed and released together. The law states that minors cannot be held in detention. The proposed new policy would separate mothers from their children. 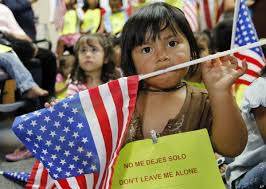 Mothers would be sent to an adult detention center under the jurisdiction of the Department of Homeland Security to be processed while their children would be taken into custody by the Office of Refugee Settlement under the Department of Health and Human Services. (Boston Globe Editorial March 14, 2017 p. A8). It is hard to imagine the pain and terror inflicted on families already suffering under the constant threat of violence - so much so that they choose to leave their homes to flee elsewhere. They come seeking safety only to discover that the nightmare continues when they reach the long sought border of the “land of the free” to be separated from one another and virtually imprisoned while strangers with power determine their fate. The threat of the “millstone around the neck” was never literal - - but the weight of the cruelty to children inherent in the proposed DHS policy ought to feel just that heavy on the neck of the powers that be. Perhaps it might weigh heavily enough to warrant reconsideration; perhaps heavily enough to warrant a turn in the direction of hospitality and compassion as attributes to be utilized when considering the fate of so many suffering members of the human family. Tomorrow we will begin a 4 day journey with 14 teenagers - children on their way to becoming adults. We will witness them participating in a process that teaches their minds how to cooperate with others to solve problems. We will watch as their budding consciousness is stimulated and shaped by their experience of seeing life from the perspective of their peers from around the world. We will also learn more about how we need to protect and nurture the precious resource that the children of the world represent for the future of humanity. For after all - we have it on great authority that they are considered the greatest in the kingdom of heaven and that it is indeed to such as these that the reign of peace belongs. The sacred texts do not discriminate across social and political boundaries. They simply tell us that we must not fail the little ones entrusted to us.